This home is part of our family-ran resort, it is a Lakefront two-story home which nests behind six cabins which are available to rent for large groups. The main house consists of five bedrooms and 4 baths. Private yet close to many amenities including shops, restaurants, public boat launches, and parks. This home is fully furnished in all the ways that make for a great carefree getaway for family and friends. Watch the sunset over Mt Konocti or fish or sit around the campfire. Free Wifi and Cable TV. Commercial grade coffee grinder and Starbucks espresso machine. Have great coffee and make yourself breakfast with the high end waffle maker that puts out a waffle every 90 seconds. Sit by the lake in the evenings or take a stroll on the private fishing pier. Need provisions... just walk 1/2 block to the local convenience store. And if you want breakfast or a meal out, both Cactus Grill and Main St. Cafe are just a few hundred feet away, As are many other small shops to browse. Watch the osprey, pelicans and ducks during morning coffee on your choice of covered patios or cozy chairs to let go of all of life's worries. A great place to relax and recover with friends or loved ones on beautiful Clear Lake. Bob and Tori hanging out by the campfire during one of their recent annual wine parties. Bob spends most of his energy maintaining and improving the lake property. Tori is a retired teacher and now runs our family dry cleaning business. They live close by and are available for assistance if anything is needed. We have lived in this home and raised our children here. We have never grown tired of life by the lake. The personality of the lake is constantly changing. Whether the wind is blowing hard and the rain pouring or the sun shining and hot... there is never a time when it is not a beautiful place to live. It is a thought provoking serene place, even within the city, escape is close at hand by just relaxing with a friend or family member or enjoying the stars at night and Venus competing with the night sky over Mt. Konocti. We are directly on the beach of Clearlake. There is usually a small beach you can walk on at certain times of the year and depending on the rain that N. California has received. 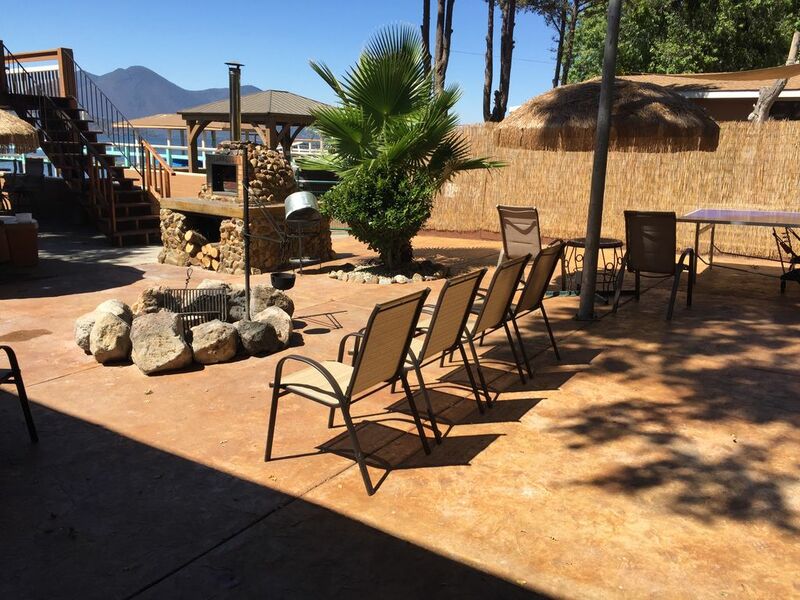 We are directly on the Lakefront, you will be able to access the lake right from the property. plenty of parking for large groups. By using the provided internet service guests agree not to use the service for any illegal uses and agrees to honor all copyright laws regarding pictures, videos, music or any other material for which they are not the owner. Should such a violation occur guests agree to hold Water's Edge Investments Inc. and its principals and employees harmless. Quality side by side refrig with icemaker. seperate micro fridge provided in the lower bedrooms. Nice updated kitchen with granite and stainless steal appliances. Pandora.com deluxe service provided free. outside: smoke whatever you want. Two kayaks and paddle boat provided with lake house. The Owners reserve the right to make changes to the property and amenities that you see in the photos. They are making constant improvements, not all pictures will depict those enhancements. Although we make every effort to maintain a consistent and quality experience we cannot guarantee that on occasion some amenities may not be available. Our group of 14 had an utterly relaxing and fun weekend sharing the house and 2 cabins. Quirky layout was delightful for all of us. Very homey. Bummer bad luck with too much wind for water skiing but the house and patios had plenty to occupy us. Everything clean, solid well kept and comfortable. Not impressed with that area of the lake. No beach access on the lake. The dock was covered with spiderwebs and the water was green and full of moss. The downstairs middle bedroom filled with bugs in the evening because the gap under the door that lead outside. The pizza oven didn't work. There was no volleyball/badminton net as shown in the pictures. A/C works good in the dining room and pool table area but other areas it was warm. We appreciate your input as we strive to make guests feel valued. it is dependent on the time of year, half the year there is beach access right from the property. When the water is high due to appreciated rain in our dry state then the beach access is limited. Mother Nature controls the health of the water, and we’re sorry you felt it was discolored from algae. We Unfortunately can not control nature. We work hard to clean the outside areas, and have monthly pest control. However the state of California forbids the use of pesticides over water; therefore it is hard to keep nature off the pier being we are in a wilderness environment. Re: the pizza oven, The on-site staff asked if the guests needed help and help was declined. As all wood-fired pizza ovens, it takes time to heat, then works impeccably; we would have been happy assist. You are correct there was no badminton, it was replaced with table tennis and two additional gazebos, we hadn’t updated photos since you booked your stay. We would love to have you return if you are interested so that we can make this a more memorable experience. Thanks again for your input so we can improve. Our large family had plenty to keep busy. Suitable for kids age 5+. Inside/outside stairs dangerous for toddlers. Great views, good water, good fishing. Kitchen well stocked. Bedrooms were all quite hot; needs better AC; bring fans. Very nice deck with water mister. Nice Water play area. Kayaks were a great hit. Tiki bar area was fun but needs a mini fridge/ice-maker. Outdoor private area fun but needs to be secured off for better security. We had an invader/thief about 1am.. Bob the owner, later reviewed security tape & saw the thief in our private area. Bob kindly wrote my son-in-law a check for stolen articles which he didn't have to do. Thank you again Bob. Spiders & gnats were an annoying issue for us. Anything left in the patio was covered with spider webs in a short time. Bug lights would help with the gnats. Regular pest service would help a lot. We could not use the beach area, about 2 blocks walk, due to broken glass in the sand and shady characters in the area. This vacation place has so much potential however the whole area/town was somewhat 'shady' & we had an unsafe feeling. Overall we had a fun week. The staff is super friendly and helpful. The stay was wonderful and the property is gorgeous. Great place with a lot of character . Bob is a great host. Second time here. We will book again. VRBO charges 2.5% to process this payment, this will be calculated for stays over 7days and will be shown before payment is completed. And the pet charge is $10 per day. Stays less than 7days the payment is added into the nightly rate. VRBO shows 100% is refunded prior to 90days, this isn't accurate, all but 5% of your booking total is returned this is a non-refundable booking fee. $500 additional is held if you cancel after 30days but less than 60days HOLIDAY WEEKEND IS A 3 NIGHT MINIMUM, case by case if you book cabins also. Check in time is 4pm and check out is 10am. Requests can be granted on case by case for earlier or later check in/out. EVENTS, such as weddings and large group parties with day vistors with occur an additional charge, please contact for pricing. Mother Nature which includes, fires floods and unpredicatable lake condtions doesn't warrant cancellation. Be aware of strict cancellation policy.